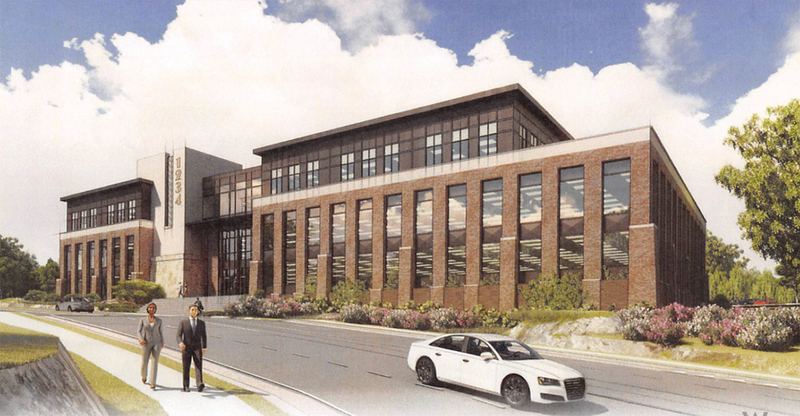 A three-story office building is proposed on the southwest corner of 106th and Illinois streets by PL Properties LLC. On Aug. 21, the Carmel Plan Commission discussed a request to rezone 5.73 acres from residential to business use, ultimately sending the item to its commercial committee to discuss Sept. 4. Developer Steve Pittman said he grew up on the land, which once housed his family’s estate. After his father died, he said a “family squabble” forced the site to be sold at auction, which he bought with two other partners. Pittman, who lives in the adjoining Reserve at Spring Mill neighborhood that he helped develop, said he felt compelled to ensure the site was developed appropriately. The office building is planned to be 80,000 square feet but could be smaller, Pittman said, depending on feedback from residents and the city. A rooftop terrace and subsurface parking are among options under consideration. Although the site is zoned residential and adjacent to two neighborhoods, Pittman said it makes sense to construct an office building on the site because other commercial buildings have been approved along Illinois Street and no residential neighborhoods have entryways from Illinois Street, the only way to access the property. Several residents who live near the site expressed concerns, including increased traffic, sightlines and effect on property values.